Mary Bromiley MBE was the inspiration behind the Equine Sports Massage Association (ESMA). Mary is a Fellow of the Chartered Society of Physiotherapy (a licensed human physiotherapist in the UK) and a pioneer of the transfer of human massage and rehabilitation techniques to equine athletes. In 1984 she built Downs House Equine Rehabilitation Centre which was the world’s first rehabilitation centre for treatment of both horse and rider. 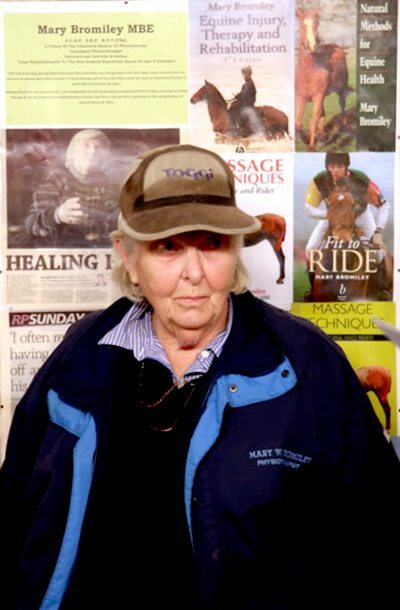 For many years Mary lectured frequently at international equine medicine conferences and she was the official physiotherapist for both horses and riders of the New Zealand Three Day Event Teams at the Olympics and World Championships. To ensure every client receives services from a highly and fully trained, qualified and insured Equine Sports Massage therapist. Mary retired from teaching the ITEC diploma in 2015 handing over delivery of the course to veterinary physiotherapist Helen Tompkins who had assisted Mary in delivery of the ITEC diploma since 2008. Mary is still closely involved with ESMA as an Honorary member. Since its foundation ESMA has grown from strength to strength and is regarded within the equine industry as the leading professional body for Equine Sports Massage Therapists within the UK. All members of ESMA are experienced horse people with years of professional knowledge. All members of ESMA are qualified in human massage. All members of ESMA have successfully passed written exams, practical assessment, veterinary viva voce and completed a dissertation. Every year ESMA members are required to complete a minimum of 20 hours of continuous professional development training. All ESMA members hold full insurance.